Taking your dog for a walk is one of life’s simple pleasures. Especially around this time of year, as summer fades into fall, and you head off into the countryside to explore with your best friend by your side - it’s pretty much the ideal, isn’t it? As wonderful as dog walks can be, they are not without their issues. It’s rarely as simple as put a leash on and everything is perfect and picturesque from that point. Dogs like to explore; they like to get dirty; and walking can be inherently hazardous. So before you head off exploring, it’s always worth ensuring you’re abiding by the golden rules to keep country walks enjoyable for both you and your pooch. If your dog is going to be bounding along through a natural trail, then there’s a good chance some creepy-crawlie on the ground is going to take one look at them and think: “ooh, yum!”Ticks, fleas, and various other insects that most of us like to pretend don’t exist, are all liable to see your dog’s soft underside as their chance for a quick snack. By far the best way of dealing with this threat is through being proactive rather than reactionary. Ensure your furry friend is safeguarded with Pet-Lock best flea and tick treatment for dogs. While this might not prevent an opportunistic critter from having a snack, at least the consequences won’t be felt for weeks to come. If you’re going to be walking through particularly dense brush, then it’s worth considering a coat for your dog to help protect their skin, too. Some dogs have a tendency to wander; i.e. if they’re let off the leash, they’re not going to be too inclined to stick close to their owners. Instead, they will take off whenever they see something that intrigues them - and there’s a strong possibility that will intrigue them if you’re going for a rural walk. The only reason way to deal with this is to use long, flexible leashes that still allow your dog the freedom to roam, but with a limit. This might feel like you’re stifling their fun, but really, you’re protecting them. It helps to know your dog as well; if they have a tendency to wander, then this might be a step you need to take. Other breeds and personalities are more likely to stick to your heels - leash or no - so use your judgement on this one. 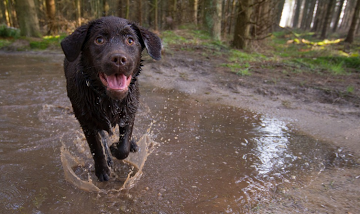 If you’re going to be taking your dog on a rural walk, then bear in mind that dogs have a staggering ability to get themselves filthy in a relatively short period of time. If they’re going to be getting back into the car to go home, you’re going to need quick methods of cleaning them up - for the moment - before the big wash when you get home. To that end, always pack a few bottles of water, some towels you don’t mind getting rid of, and paper towels. It might not be the most thorough wash, but it’ll do until you can get them home and into the bath! Happy walking!